Located in Bezons, a 15-minute drive from La Défense business district, Kyriad Paris Ouest ? Bezons La Défense offers air-conditioned guest rooms with free Wi-Fi access. There is a 24-hour front desk and free private parking is possible on site. 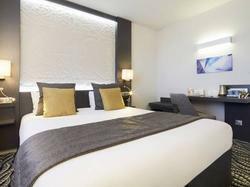 Each room includes a flat-screen TV with satellite channels and a welcome tray with tea, coffee and biscuits. The private bathroom is fitted with a bath or shower and has a hairdryer and free toiletries. A buffet breakfast is available daily, and you may enjoy other meals in the hotel's restaurant. Central Paris is a 30-minute drive from Kyriad Paris Ouest ? Bezons La Défense. Access to both the A14 and the A 86 motorways is within a 10-minute drive from the hotel. Each air-conditioned room includes a welcome tray, a flat-screen TV with satellite channels and a private bathroom with a bath or shower, a hairdryer and free toiletries.